Collection Procedure: Collect approximately 1 to 2 grams of each type of material and place into separate 20 mL scintillation vials. Analytical Procedure: A portion of each separate phase is analyzed by gross examination, phase-polar examination, and central stop dispersion microscopy. Commercial manufacturers and products mentioned in this method are for descriptive use only and do not constitute endorsements by USDOL-OSHA. Similar products from other sources may be substituted. Amphibole: A family of minerals whose crystals are formed by long, thin units which have two thin ribbons of double chain silicate with a brucite ribbon in between. The shape of each unit is similar to an “I beam”. Minerals important in asbestos analysis include cummingtonite-grunerite, crocidolite, tremolite-actinolite and anthophyllite. Aspect Ratio: The ratio of the length of a fiber to its diameter usually defined as “length : width”, e.g. 3:1. Brucite: A sheet mineral with the composition Mg(OH)(2). Fiber: A particle longer than or equal to 5μm with a length to width ratio greater than or equal to 3:1. This may include cleavage fragments. (see section 3.5 of this appendix). Phase-Polar Analysis: This is the use of polarized light in a phase contrast microscope. It is used to see the same size fibers that are visible in air filter analysis. Although fibers finer than 1μm are visible, analysis of these is inferred from analysis of larger bundles that are usually present. Serpentine: A mineral family consisting of minerals with the general composition Mg(3)(Si(2)O(5)(OH)(4) having the magnesium in brucite layer over a silicate layer. Minerals important in asbestos analysis included in this family are chrysotile, lizardite, antigorite. Light microscopy has been used for well over 100 years for the determination of mineral species. This analysis is carried out using specialized polarizing microscopes as well as bright field microscopes. The identification of minerals is an on-going process with many new minerals described each year. The first recorded use of asbestos was in Finland about 2500 B.C. where the material was used in the mud wattle for the wooden huts the people lived in as well as strengthening for pottery. Adverse health aspects of the mineral were noted nearly 2000 years ago when Pliny the Younger wrote about the poor health of slaves in the asbestos mines. Although known to be injurious for centuries, the first modern references to its toxicity were by the British Labor Inspectorate when it banned asbestos dust from the workplace in 1898. Asbestosis cases were described in the literature after the turn of the century. Cancer was first suspected in the mid 1930's and a causal link to mesothelioma was made in 1965. Because of the public concern for worker and public safety with the use of this material, several different types of analysis were applied to the determination of asbestos content. Light microscopy requires a great deal of experience and craft. Attempts were made to apply less subjective methods to the analysis. X-ray diffraction was partially successful in determining the mineral types but was unable to separate out the fibrous portions from the non-fibrous portions. Also, the minimum detection limit for asbestos analysis by X-ray diffraction (XRD) is about 1%. Differential Thermal Analysis (DTA) was no more successful. These provide useful corroborating information when the presence of asbestos has been shown by microscopy; however, neither can determine the difference between fibrous and non-fibrous minerals when both habits are present. The same is true of Infrared Absorption (IR). When electron microscopy was applied to asbestos analysis, hundreds of fibers were discovered present too small to be visible in any light microscope. There are two different types of electron microscope used for asbestos analysis: Scanning Electron Microscope (SEM) and Transmission Electron Microscope (TEM). Scanning Electron Microscopy is useful in identifying minerals. The SEM can provide two of the three pieces of information required to identify fibers by electron microscopy: morphology and chemistry. The third is structure as determined by Selected Area Electron Diffraction - SAED which is performed in the TEM. Although the resolution of the SEM is sufficient for very fine fibers to be seen, accuracy of chemical analysis that can be performed on the fibers varies with fiber diameter in fibers of less than 0.2μm diameter. The TEM is a powerful tool to identify fibers too small to be resolved by light microscopy and should be used in conjunction with this method when necessary. The TEM can provide all three pieces of information required for fiber identification. Most fibers thicker than 1μm can adequately be defined in the light microscope. The light microscope remains as the best instrument for the determination of mineral type. This is because the minerals under investigation were first described analytically with the light microscope. It is inexpensive and gives positive identification for most samples analyzed. Further, when optical techniques are inadequate, there is ample indication that alternative techniques should be used for complete identification of the sample. Minerals consist of atoms that may be arranged in random order or in a regular arrangement. Amorphous materials have atoms in random order while crystalline materials have long range order. Many materials are transparent to light, at least for small particles or for thin sections. The properties of these materials can be investigated by the effect that the material has on light passing through it. 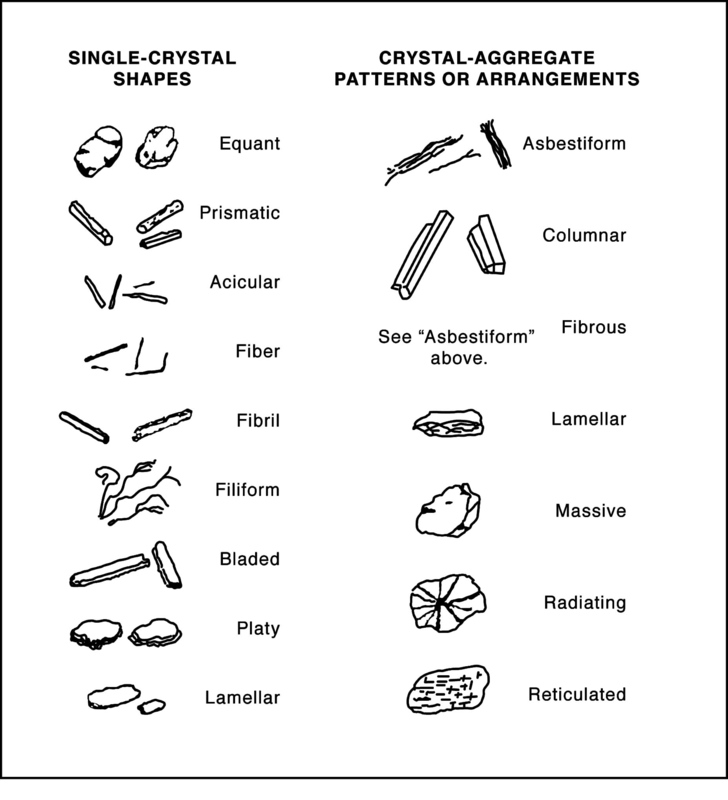 The six asbestos minerals are all crystalline with particular properties that have been identified and cataloged. These six minerals are anisotropic. They have a regular array of atoms, but the arrangement is not the same in all directions. Each major direction of the crystal presents a different regularity. Light photons travelling in each of these main directions will encounter different electrical neighborhoods, affecting the path and time of travel. The techniques outlined in this method use the fact that light traveling through fibers or crystals in different directions will behave differently, but predictably. The behavior of the light as it travels through a crystal can be measured and compared with known or determined values to identify the mineral species. Usually, Polarized Light Microscopy (PLM is performed with strain-free objectives on a bright-field microscope platform. This would limit the resolution of the microscope to about 0.4μm. Because OSHA requires the counting and identification of fibers visible in phase contrast, the phase contrast platform is used to visualize the fibers with the polarizing elements added into the light path. Polarized light methods cannot identify fibers finer than about 1μm in diameter even though they are visible. The finest fibers are usually identified by inference from the presence of larger, identifiable fiber bundles. When fibers are present, but not identifiable by light microscopy, use either SEM or TEM to determine the fiber identity. (a) Basic identification of the materials was first performed by light microscopy and gross analysis. This provides a large base of published information against which to check analysis and analytical technique. (b) The analysis is specific to fibers. The minerals present can exist in asbestiform, fibrous, prismatic, or massive varieties all at the same time. Therefore, bulk methods of analysis such as X-ray diffraction, IR analysis, DTA, etc. are inappropriate where the material is not known to be fibrous. (c) The analysis is quick, requires little preparation time, and can be performed on-site if a suitably equipped microscope is available. (a) Even using phase-polar illumination, not all the fibers present may be seen. This is a problem for very low asbestos concentrations where agglomerations or large bundles of fibers may not be present to allow identification by inference. (b) The method requires a great degree of sophistication on the part of the microscopist. An analyst is only as useful as his mental catalog of images. Therefore, a microscopist's accuracy is enhanced by experience. The mineralogical training of the analyst is very important. It is the basis on which subjective decisions are made. (c) The method uses only a tiny amount of material for analysis. This may lead to sampling bias and false results (high or low). This is especially true if the sample is severely inhomogeneous. (d) Fibers may be bound in a matrix and not distinguishable as fibers so identification cannot be made. 1.4.1. This method can be used for determination of asbestos content from 0 to 100% asbestos. The detection limit has not been adequately determined, although for selected samples, the limit is very low, depending on the number of particles examined. For mostly homogeneous, finely divided samples, with no difficult fibrous interferences, the detection limit is below 1%. For inhomogeneous samples (most samples), the detection limit remains undefined. NIST has conducted proficiency testing of laboratories on a national scale. Although each round is reported statistically with an average, control limits, etc., the results indicate a difficulty in establishing precision especially in the low concentration range. It is suspected that there is significant bias in the low range especially near 1%. EPA tried to remedy this by requiring a mandatory point counting scheme for samples less than 10%. The point counting procedure is tedious, and may introduce significant biases of its own. It has not been incorporated into this method. 1.4.2. The precision and accuracy of the quantitation tests performed in this method are unknown. Concentrations are easier to determine in commercial products where asbestos was deliberately added because the amount is usually more than a few percent. An analyst's results can be “calibrated” against the known amounts added by the manufacturer. For geological samples, the degree of homogeneity affects the precision. 1.4.3. The performance of the method is analyst dependent. The analyst must choose carefully and not necessarily randomly the portions for analysis to assure that detection of asbestos occurs when it is present. For this reason, the analyst must have adequate training in sample preparation, and experience in the location and identification of asbestos in samples. This is usually accomplished through substantial on-the-job training as well as formal education in mineralogy and microscopy. The nominal chemical compositions for the asbestos minerals were given in Section 1. Compared to cleavage fragments of the same minerals, asbestiform fibers possess a high tensile strength along the fiber axis. They are chemically inert, noncombustible, and heat resistant. Except for chrysotile, they are insoluble in Hydrochloric acid (HCl). Chrysotile is slightly soluble in HCl. Asbestos has high electrical resistance and good sound absorbing characteristics. It can be woven into cables, fabrics or other textiles, or matted into papers, felts, and mats. Possible physiologic results of respiratory exposure to asbestos are mesothelioma of the pleura or peritoneum, interstitial fibrosis, asbestosis, pneumoconiosis, or respiratory cancer. The possible consequences of asbestos exposure are detailed in the NIOSH Criteria Document or in the OSHA Asbestos Standards 29 CFR 1910.1001, 29 CFR 1926.1101, and 29 CFR 1915.1001. (a) Do not make unnecessary dust. (b) Take only a small amount (1 to 2 g). (c) Tightly close the sample container. (d) Use encapsulant to seal the spot where the sample was taken, if necessary. If a cork-borer type sampler is available, push the tube through the material all the way, so that all layers of material are sampled. Some samplers are intended to be disposable. These should be capped and sent to the laboratory. If a non-disposable cork borer is used, empty the contents into a scintillation vial and send to the laboratory. Vigorously and completely clean the cork borer between samples. (a) Seal the samples with a sample seal over the end to guard against tampering and to identify the sample. (b) Package the bulk samples in separate packages from the air samples. They may cross-contaminate each other and will invalidate the results of the air samples. (c) Include identifying paperwork with the samples, but not in contact with the suspected asbestos. (d) To maintain sample accountability, ship the samples by certified mail, overnight express, or hand carry them to the laboratory. (a) Do not create unnecessary dust. Handle the samples in HEPA- filter equipped hoods. If samples are received in bags, envelopes or other inappropriate container, open them only in a hood having a face velocity at or greater than 100 fpm. Transfer a small amount to a scintillation vial and only handle the smaller amount. (b) Open samples in a hood, never in the open lab area. (c) Index of refraction oils can be toxic. Take care not to get this material on the skin. Wash immediately with soap and water if this happens. (d) Samples that have been heated in the muffle furnace or the drying oven may be hot. Handle them with tongs until they are cool enough to handle. (e) Some of the solvents used, such as THF (tetrahydrofuran), are toxic and should only be handled in an appropriate fume hood and according to instructions given in the Safety Data Sheet (SDS). (b) Stereo microscope with reflected light illumination, transmitted light illumination, polarizer, analyzer and first order red or gypsum plate, and rotating stage. (j) Glass slides with painted or frosted ends 1x3 inches 1mm thick, precleaned. Samples with a high water content will not give the proper dispersion colors and must be dried prior to sample mounting. Remove the lid of the scintillation vial, place the bottle in the drying oven and heat at 100 deg.C to dryness (usually about 2 h). Samples which are not submitted to the lab in glass must be removed and placed in glass vials or aluminum weighing pans before placing them in the drying oven. These may include samples with tar as a matrix, vinyl asbestos tile, or any other organic that can be reduced by heating. Remove the sample from the vial and weigh in a balance to determine the weight of the submitted portion. Place the sample in a muffle furnace at 500 deg.C for 1 to 2 h or until all obvious organic material has been removed. Retrieve, cool and weigh again to determine the weight loss on ignition. This is necessary to determine the asbestos content of the submitted sample, because the analyst will be looking at a reduced sample. NOTE: Heating above 600 deg.C will cause the sample to undergo a structural change which, given sufficient time, will convert the chrysotile to forsterite. Heating even at lower temperatures for 1 to 2 h may have a measurable effect on the optical properties of the minerals. If the analyst is unsure of what to expect, a sample of standard asbestos should be heated to the same temperature for the same length of time so that it can be examined for the proper interpretation. (1) If the sample has large lumps, is hard, or cannot be made to lie under a cover slip, the grain size must be reduced. Place a small amount between two slides and grind the material between them or grind a small amount in a clean mortar and pestle. The choice of whether to use an alumina, ruby, or diamond mortar depends on the hardness of the material. Impact damage can alter the asbestos mineral if too much mechanical shock occurs. (Freezer mills can completely destroy the observable crystallinity of asbestos and should not be used). For some samples, a portion of material can be shaved off with a scalpel, ground off with a hand grinder or hack saw blade. (2) If the sample is powder or has been reduced as in (1) above, it is ready to mount. Place a glass slide on a piece of optical tissue and write the identification on the painted or frosted end. Place two drops of index of refraction medium n=1.550 on the slide. (The medium n=1.550 is chosen because it is the matching index for chrysotile. Dip the end of a clean paper-clip or dissecting needle into the droplet of refraction medium on the slide to moisten it. Then dip the probe into the powder sample. Transfer what sticks on the probe to the slide. The material on the end of the probe should have a diameter of about 3 mm for a good mount. If the material is very fine, less sample may be appropriate. For non-powder samples such as fiber mats, forceps should be used to transfer a small amount of material to the slide. Stir the material in the medium on the slide, spreading it out and making the preparation as uniform as possible. Place a cover-slip on the preparation by gently lowering onto the slide and allowing it to fall “trapdoor” fashion on the preparation to push out any bubbles. Press gently on the cover slip to even out the distribution of particulate on the slide. If there is insufficient mounting oil on the slide, one or two drops may be placed near the edge of the coverslip on the slide. Capillary action will draw the necessary amount of liquid into the preparation. Remove excess oil with the point of a laboratory wiper. Treat at least two different areas of each phase in this fashion. Choose representative areas of the sample. It my be useful to select particular areas or fibers for analysis. This is useful to identify asbestos in severely inhomogeneous samples. (2) Examination under polarized light on the stereo microscope. (3) Examination by phase-polar illumination on the compound phase microscope. (4) Determination of species by dispersion stain. Examination by Becke line analysis may also be used; however, this is usually more cumbersome for asbestos determination. (5) Difficult samples may need to be analyzed by SEM or TEM, or the results from those techniques combined with light microscopy for a definitive identification. For the purpose of regulation, the mineral must be one of the six minerals covered and must be in the asbestos growth habit. Large specimen samples of asbestos generally have the gross appearance of wood. Fibers are easily parted from it. Asbestos fibers are very long compared with their widths. The fibers have a very high tensile strength as demonstrated by bending without breaking. Asbestos fibers exist in bundles that are easily parted, show longitudinal fine structure and may be tufted at the ends showing “bundle of sticks” morphology. In the microscope some of these properties may not be observable. Amphiboles do not always show striations along their length even when they are asbestos. Neither will they always show tufting. They generally do not show a curved nature except for very long fibers. Asbestos and asbestiform minerals are usually characterized in groups by extremely high aspect ratios (greater than 100:1). While aspect ratio analysis is useful for characterizing populations of fibers, it cannot be used to identify individual fibers of intermediate to short aspect ratio. Observation of many fibers is often necessary to determine whether a sample consists of “cleavage fragments” or of asbestos fibers. Most cleavage fragments of the asbestos minerals are easily distinguishable from true asbestos fibers. This is because true cleavage fragments usually have larger diameters than 1μm. Internal structure of particles larger than this usually shows them to have no internal fibrillar structure. In addition, cleavage fragments of the monoclinic amphiboles show inclined extinction under crossed polars with no compensator. Asbestos fibers usually show extinction at zero degrees or ambiguous extinction if any at all. Morphologically, the larger cleavage fragments are obvious by their blunt or stepped ends showing prismatic habit. Also, they tend to be circular rather than filiform. Where the particles are less than 1μm in diameter and have an aspect ratio greater than or equal to 3:1, it is recommended that the sample be analyzed by SEM or TEM if there is any question whether the fibers are cleavage fragments or asbestiform particles. Care must be taken when analyzing by electron microscopy because the interferences are different from those in light microscopy and may structurally be very similar to asbestos. The classic interference is between anthophyllite and biopyribole or intermediate fiber. Use the same morphological clues for electron microscopy as are used for light microscopy, e.g. fibril splitting, internal longitudinal striation, fraying, curvature, etc. Examine the sample, preferably in the glass vial. Determine the presence of any obvious fibrous component. Estimate a percentage based on previous experience and current observation. Determine whether any prepreparation is necessary. Determine the number of phases present. This step may be carried out or augmented by observation at 6 to 40 x under a stereo microscope. (2) After performing any necessary pre-preparation, prepare slides of each phase as described above. Two preparations of the same phase in the same index medium can be made side-by-side on the same glass for convenience. Examine with the polarizing stereo microscope. Estimate the percentage of asbestos based on the amount of birefringent fiber present. (3) Examine the slides on the phase-polar microscopes at magnifications of 160 and 400x. Note the morphology of the fibers. Long, thin, very straight fibers with little curvature are indicative of fibers from the amphibole family. Curved, wavy fibers are usually indicative of chrysotile. Estimate the percentage of asbestos on the phase-polar microscope under conditions of crossed polars and a gypsum plate. Fibers smaller than 1.0μm in thickness must be identified by inference to the presence of larger, identifiable fibers and morphology. If no larger fibers are visible, electron microscopy should be performed. At this point, only a tentative identification can be made. Full identification must be made with dispersion microscopy. Details of the tests are included in the appendices. n = 1.670 or 1.680.
n = 1.605 and 1.620. Where more than one liquid is suggested, the first is preferred; however, in some cases this liquid will not give good dispersion color. Take care to avoid interferences in the other liquid; e.g., wollastonite in n=1.620 will give the same colors as tremolite. In n =1.605 wollastonite will appear yellow in all directions. Wollastonite may be determined under crossed polars as it will change from blue to yellow as it is rotated along its fiber axis by tapping on the cover slip. Asbestos minerals will not change in this way. Determination of the angle of extinction may, when present, aid in the determination of anthophyllite from tremolite. True asbestos fibers usually have 0 deg. extinction or ambiguous extinction, while cleavage fragments have more definite extinction. (5) Some fibers have a coating on them which makes dispersion microscopy very difficult or impossible. Becke line analysis or electron microscopy may be performed in those cases. Determine the percentage by light microscopy. TEM analysis tends to overestimate the actual percentage present. (6) Percentage determination is an estimate of occluded area, tempered by gross observation. Gross observation information is used to make sure that the high magnification microscopy does not greatly over-or under-estimate the amount of fiber present. This part of the analysis requires a great deal of experience. Satisfactory models for asbestos content analysis have not yet been developed, although some models based on metallurgical grain-size determination have found some utility. Estimation is more easily handled in situations where the grain sizes visible at about 160x are about the same and the sample is relatively homogeneous. Step 1. 60% remains after heating at 550 deg.C for 1 h.
Polarized light interacts with matter in the direction of the electric vector. This is the polarization direction. Using this property it is possible to use polarized light to probe different materials and identify them by how they interact with light. The speed of light in a vacuum is a constant at about 2.99 x 10(8) m/s. When light travels in different materials such as air, water, minerals or oil, it does not travel at this speed. It travels slower. This slowing is a function of both the material through which the light is traveling and the wavelength or frequency of the light. In general, the more dense the material, the slower the light travels. Also, generally, the higher the frequency, the slower the light will travel. The ratio of the speed of light in a vacuum to that in a material is called the index of refraction (n). It is usually measured at 589 nm (the sodium D line). If white light (light containing all the visible wavelengths) travels through a material, rays of longer wavelengths will travel faster than those of shorter wavelengths, this separation is called dispersion. Dispersion is used as an identifier of materials as described in Section 4.6. With the exception of anthophyllite, all the asbestos minerals belong to the monoclinic crystal type. The unit cell is the basic repeating unit of the crystal and for monoclinic crystals can be described as having three unequal sides, two 90 deg. angles and one angle not equal to 90 deg.. The orthorhombic group, of which anthophyllite is a member has three unequal sides and three 90 deg. angles. The unequal sides are a consequence of the complexity of fitting the different atoms into the unit cell. Although the atoms are in a regular array, that array is not symmetrical in all directions. There is long range order in the three major directions of the crystal. However, the order is different in each of the three directions. This has the effect that the index of refraction is different in each of the three directions. Using polarized light, we can investigate the index of refraction in each of the directions and identify the mineral or material under investigation. The indices alpha, beta, and gamma are used to identify the lowest, middle, and highest index of refraction respectively. The x direction, associated with alpha is called the fast axis. Conversely, the z direction is associated with gamma and is the slow direction. Crocidolite has alpha along the fiber length making it “length-fast”. The remainder of the asbestos minerals have the gamma axis along the fiber length. They are called “length-slow”. This orientation to fiber length is used to aid in the identification of asbestos. Polarized light microscopy as described in this section uses the phase-polar microscope described in Section 3.2. A phase contrast microscope is fitted with two polarizing elements, one below and one above the sample. The polarizers have their polarization directions at right angles to each other. Depending on the tests performed, there may be a compensator between these two polarizing elements. A compensator is a piece of mineral with known properties that “compensates” for some deficiency in the optical train. Light emerging from a polarizing element has its electric vector pointing in the polarization direction of the element. The light will not be subsequently transmitted through a second element set at a right angle to the first element. Unless the light is altered as it passes from one element to the other, there is no transmission of light. After the polarization direction has been identified in the field of view, move the particle of interest to the center of the field of view and align it with the polarization direction. For fibers, align the fiber along this direction. Note the angular reading of the rotating stage. Looking at the particle, rotate the stage until the fiber goes dark or “blinks out”. Again note the reading of the stage. The difference in the first reading and the second is an angle of extinction. The color depends on the difference of the two visible indices of refraction and the thickness of the crystal. The maximum difference available is the difference between the alpha and the gamma axes. This maximum difference is usually tabulated as the birefringence of the crystal. n alpha, gamma = indices of refraction. Examination of the equation for asbestos minerals reveals that the visible colors for almost all common asbestos minerals and fiber sizes are shades of gray and black. The eye is relatively poor at discriminating different shades of gray. It is very good at discriminating different colors. In order to compensate for the low retardation, a compensator is added to the light train between the polarization elements. The compensator used for this test is a gypsum plate of known thickness and birefringence. Such a compensator when oriented at 45 deg. to the polarizer direction, provides a retardation of 530 nm of the 530 nm wavelength color. This enhances the red color and gives the background a characteristic red to red-magenta color. If this “full-wave” compensator is in place when the asbestos preparation is inserted into the light train, the colors seen on the fibers are quite different. Gypsum, like asbestos has a fast axis and a slow axis. When a fiber is aligned with its fast axis in the same direction as the fast axis of the gypsum plate, the ray vibrating in the slow direction is retarded by both the asbestos and the gypsum. This results in a higher retardation than would be present for either of the two minerals. The color seen is a second order blue. When the fiber is rotated 90 deg. using the rotating stage, the slow direction of the fiber is now aligned with the fast direction of the gypsum and the fast direction of the fiber is aligned with the slow direction of the gypsum. Thus, one ray vibrates faster in the fast direction of the gypsum, and slower in the slow direction of the fiber; the other ray will vibrate slower in the slow direction of the gypsum and faster in the fast direction of the fiber. In this case, the effect is subtractive and the color seen is a first order yellow. As long as the fiber thickness does not add appreciably to the color, the same basic colors will be seen for all asbestos types except crocidolite. In crocidolite the colors will be weaker, may be in the opposite directions, and will be altered by the blue absorption color natural to crocidolite. Hundreds of other materials will give the same colors as asbestos, and therefore, this test is not definitive for asbestos. The test is useful in discriminating against fiberglass or other amorphous fibers such as some synthetic fibers. Certain synthetic fibers will show retardation colors different than asbestos; however, there are some forms of polyethylene and aramid which will show morphology and retardation colors similar to asbestos minerals. This test must be supplemented with a positive identification test when birefringent fibers are present which cannot be excluded by morphology. This test is relatively ineffective for use on fibers less than 1μm in diameter. For positive confirmation TEM or SEM should be used if no larger bundles or fibers are visible. Make a preparation in the suspected matching high dispersion oil, e.g., n=1.550 for chrysotile. Perform the preliminary tests to determine whether the fibers are birefringent or not. Take note of the morphological character. Wavy fibers are indicative of chrysotile while long, straight, thin, frayed fibers are indicative of amphibole asbestos. This can aid in the selection of the appropriate matching oil. The microscope is set up and the polarization direction is noted as in Section 4.4. Align a fiber with the polarization direction. Note the color. This is the color parallel to the polarizer. Then rotate the fiber rotating the stage 90 deg. so that the polarization direction is across the fiber. This is the perpendicular position. Again note the color. Both colors must be consistent with standard asbestos minerals in the correct direction for a positive identification of asbestos. If only one of the colors is correct while the other is not, the identification is not positive. If the colors in both directions are bluish-white, the analyst has chosen a matching index oil which is higher than the correct matching oil, e.g. the analyst has used n=1.620 where chrysotile is present. The next lower oil (Section 3.5.) should be used to prepare another specimen. If the color in both directions is yellow-white to straw-yellow-white, this indicates that the index of the oil is lower than the index of the fiber, e.g. the preparation is in n=1.550 while anthophyllite is present. Select the next higher oil (Section 3.5.) and prepare another slide. Continue in this fashion until a positive identification of all asbestos species present has been made or all possible asbestos species have been ruled out by negative results in this test. Certain plant fibers can have similar dispersion colors as asbestos. Take care to note and evaluate the morphology of the fibers or remove the plant fibers in pre-preparation. Coating material on the fibers such as carbonate or vinyl may destroy the dispersion color. Usually, there will be some outcropping of fiber which will show the colors sufficient for identification. When this is not the case, treat the sample as described in Section 3.3. and then perform dispersion staining. Some samples will yield to Becke line analysis if they are coated or electron microscopy can be used for identification. 5.1. Crane, D.T., Asbestos in Air, OSHA method ID160, Revised November 1992. 5.2. Ford, W.E., Dana's Textbook of Mineralogy; Fourth Ed. ; John Wiley and Son, New York, 1950, p. vii. 5.3. Selikoff, I.J., Lee, D.H.K., Asbestos and Disease, Academic Press, New York, 1978, pp. 3,20. 5.4. Women Inspectors of Factories. Annual Report for 1898, H.M. Statistical Office, London, p. 170 (1898). 5.5. Selikoff, I.J., Lee, D.H.K., Asbestos and Disease, Academic Press, New York, 1978, pp. 26,30. 5.6. Campbell, W.J., et al, Selected Silicate Minerals and Their Asbestiform Varieties, United States Department of the Interior, Bureau of Mines, Information Circular 8751, 1977. 5.7. Asbestos, Code of Federal Regulations, 29 CFR 1910.1001 and 29 CFR 1926.58. 5.8. National Emission Standards for Hazardous Air Pollutants; Asbestos NESHAP Revision, Federal Register, Vol. 55, No. 224, 20 November 1990, p. 48410. 5.9. Ross, M. The Asbestos Minerals: Definitions, Description, Modes of Formation, Physical and Chemical Properties and Health Risk to the Mining Community, Nation Bureau of Standards Special Publication, Washington, D.C., 1977. 5.10. Lilis, R., Fibrous Zeolites and Endemic Mesothelioma in Cappadocia, Turkey, J. Occ Medicine, 1981, 23,(8),548-550. 5.11. Occupational Exposure to Asbestos - 1972, U.S. Department of Health Education and Welfare, Public Health Service, Center for Disease Control, National Institute for Occupational Safety and Health, HSM-72-10267. 5.12. Campbell,W.J., et al, Relationship of Mineral Habit to Size Characteristics for Tremolite Fragments and Fibers, United States Department of the Interior, Bureau of Mines, Information Circular 8367, 1979. 5.13. Mefford, D., DCM Laboratory, Denver, private communication, July 1987. 5.14. Deer, W.A., Howie, R.A., Zussman, J., Rock Forming Minerals, Longman, Thetford, UK, 1974. 5.15. Kerr, P.F., Optical Mineralogy; Third Ed. McGraw-Hill, New York, 1959. 5.16. Veblen, D.R. (Ed. ), Amphiboles and Other Hydrous Pyriboles - Mineralogy, Reviews in Mineralogy, Vol 9A, Michigan, 1982, pp 1 - 102. 5.17. Dixon, W.C., Applications of Optical Microscopy in the Analysis of Asbestos and Quartz, ACS Symposium Series, No. 120, Analytical Techniques in Occupational Health Chemistry, 1979. 5.18. Polarized Light Microscopy, McCrone Research Institute, Chicago, 1976. 5.19. Asbestos Identification, McCrone Research Institute, G & G printers, Chicago, 1987. 5.20. McCrone, W.C., Calculation of Refractive Indices from Dispersion Staining Data, The Microscope, No 37, Chicago, 1989. 5.21. Levadie, B. (Ed. ), Asbestos and Other Health Related Silicates, ASTM Technical Publication 834, ASM, Philadelphia 1982. 5.22. Steel, E. and Wylie, A., Riordan, P.H. (Ed. ), Mineralogical Characteristics of Asbestos, Geology of Asbestos Deposits, pp. 93-101, SME-AIME, 1981. 5.23. Zussman, J., The Mineralogy of Asbestos, Asbestos: Properties, Applications and Hazards, pp. 45-67 Wiley, 1979. Note: Authority cited: Section 142.3. Labor Code. Reference: Section 142.3, Labor Code. 1. New Appendix K to section 1529 filed 5-3-96; operative 7-3-96 (Register 96, No. 18). 2. Change without regulatory effect repealing and adopting new Figure 1 filed 5-19-2008 pursuant to section 100, title 1, California Code of Regulations (Register 2008, No. 21). 3. Amendment of subsection 3.1(e) filed 5-5-2014; operative 5-6-2014 pursuant to Government Code section 11343.4(b)(3) (Register 2014, No. 19).